What are the challenges to achieving cold fusion? I am an absolute neophyte regarding physics. What are the challenges to achieving cold fusion? I'm not sure this is a duplicate of Why is cold fusion considered bogus?, because that question is talking largely about the validity of some claims of cold fusion being realized. This question is specifically asking about the challenges of cold fusion and how they may be addressed in the emerging study of "low energy nuclear reactions"
The binding energy curve for nucleons in nuclei shows which atoms can take part in fusion, releasing energy in the process. This is an example of a fusion reaction, the one that is actually being materialized in ITER, fusion of deuterium with tritium creating helium-4. ITER is hot fusion, because it requires a very hot plasma in a Tokamak machine. Why such high plasma energies? So as to overcome the Coulomb barrier as stated in the comments to the question. For two nuclei to fuse they have to get through the Coulomb barrier, since both will have positive charge and will repulse each other. Cold fusion started with the hypothesis that, since nature is quantum mechanical, a way can be found to overcome this barrier by some collective phenomena in crystals. The hypothesis for the mechanism is that in the crystal an electron can bind with a proton and behave like a neutron .Up to now I am not aware of a published peer reviewed demonstration that the original Palladium experiment in cold fusion was really demonstrating fusion, though efforts continue. The energies released are not high enough for fusion, was the damaging criticism when cold fusion first appeared. On the other hand people have since tried other crystal structures and claim success and even promise to deliver working reactors. No peer reviewed publications from there either, but they can be excused since they have applied for patents and are going commercial. There is a branch off also by another company claiming similar success. We are waiting. There even exists a video from a NASA researchers on cold fusion. I have found though this interesting video which is not directly cold fusion, except that it can be carried out in the kitchen which can be considered cold, dust fusion! Where the claim is that the plasma temperatures needed for fusion can be achieved with the energy input of a microwave oven. I found that Pyrolytic-carbon could explain the effects in the dust fusion video linked above, without transmutation. It is also more diamagnetic (-400x10^-6) against the cleavage plane, exhibiting the greatest diamagnetism (by weight) of any room temperature diamagnet. It is even possible to levitate reasonably pure and sufficiently ordered samples over rare earth permanent magnets. which is a whitepaper on the subject I just released. To fully follow the arguments however, you will probably need to at least look at the first 8 refernces listed, as they are my 4 peer-reviewed publications in the field and related cold fusioneer responses. In my whitepaper, I outline why the original F&P calorimetric conclusions were likely incorrect. In my 2002 publication I show how apparent excess heat signals can arise in F&P electrochemical cells. I talk about other errors in the 2010 publication, and the gross misrepresentation of what I say in the 2010 response should be more than adequate to demonstrate the biased approach taken by cold fusion researchers. I noted above a lot of talk about 'normal' fusion mechanisms. You should all realize that the response to these kinds of criticisms is "OK, we agree, but we found a new type of nuclear reaction, which is why we prefer to call the field Low Energy Nuclear Reactions (LENR)." In other words, stating that they do not show conformance to conventional fusion characteristics is a nearly meaningless activity these days. Good historical info though. Most of my work has focused on those F&P cells, especially on the excess heat claims, which comprise about half of all the evidence for cold fusion. In 2000, Dr. Ed Storms posted some CF data he collected on the 'net, and I grabbed it and analyzed it by assuming no excess energy. In other words I was testing the zero excess power, Pex, thesis mathematically. Typically, calorimetry is done via a calibrated technique where a constant temperature is measured as a reference and a variable temperature controlled by the experimental process is mathematically compared to it via most typically power balance equations. In theory the excess power is the difference between the output and input power. In F&P cells the input power (Watts) is just the cell voltage (V or E, volts) times the current (I, amps) flowing through the cell. A fraction of that power goes into electrolysis, and is computed as Eth * I, where Eth is the thermoneutral voltage for the specific form of water (differs due to isotope effects). The output power is computed based on a temperature difference, dT, from an equation for the particular method you are using. So for a flow calorimeter, the equation is Pout = k * Cp* f * dT, where Cp is the heat capacity of the fluid at constant pressure, f is its flow rate, and k is the calibration constant in the correct uints. Many times linear regression is used to fit the calibration data which also gives a second additive constant. What I found in the reanalysis was that if you change the calibration constant by +/-3% max, you could zero out all the signals. 3% is not much, and it represents a very good analytical technique, yet that small change produces artificial Pex in an F&P calorimetric study. 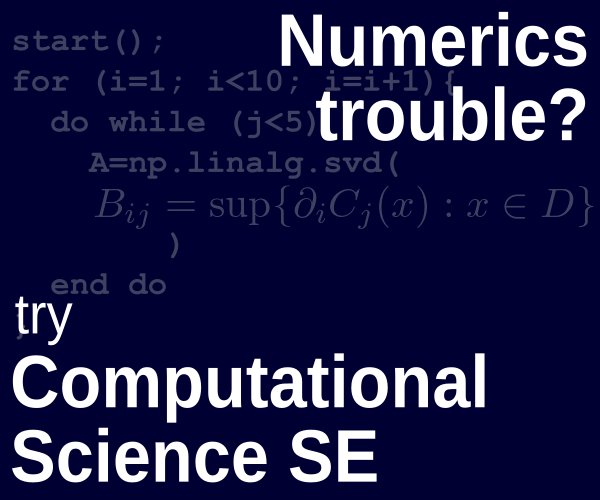 What that means is that in order to evaluate the validity of an excess heat signal, you need to have the calibration equation used, the numeric calibration constants, and the variation in those constants so that the approximated error bar on the output power can be calculated. To date this information has never been supplied in the literature. The few times I have looked at Pex claims and pieced this information together, I have concluded the signals were consistent with this error. So what that does is throw all calorimetric claims into question, since one doesn't know how big the error bars are on the claimed amounts of excess heat. In principle, there is a limit to how big that can get, but the details aren’t readily developed if the basic information above isn’t supplied. For my study, I analyzed Storms' data, which had 10 voltage sweeps in it, and found the required calibration constants for zero excess heat, and then noted there were systematic patterns in those results. I then proceeded to explain via a simple two-region model of a F&P cell how such a calibration constant shift could occur, concluding a shift in heat distribution in the cell would do it. Then I speculated on a chemical mechanism that would produce such a shift, pointing at H2+O2 recombination at the electrode surface as the likely mechanism. Szpak, et al have even videoed hot spots on working electrodes but they called them ‘mini-nuclear explosions’ of course. The physical size of individual hot spots was of the approximate size of bubbles produced by electrolysis however. So with respect to F&P cell calorimetry, I showed in one set of experiments that a simple calibration constant shift model could explain the apparent excess heat signals, and I provide some basic rationales for how that could happen and which could be experimentally tested. Subsequently, this was challenged in the literature, but I responded with more explanation and the illustration that the data provided by the dissenting authors was consistent with my proposal. And later, Storms wrote an attempted rebuttal of this to which I replied, showing how the proposed rebuttal was not adequate. In 2010 I wrote a long Comment on a 2009 review article that delineated experimental problems that were glossed over in the original report. A group of 10 prominent CF researchers tried to rebut my Comment, but only proved their lack of understanding of my proposal by insisting on discussing it as if it were a random problem, when I had said in all 4 of my publications on the subject that it was systematic. Ergo, the proffered rebuttal was irrelevant. In that 2010 paper I added a few more comments on the CFers interpretation of analytical results, and I have here made some specific comments on other results over in the "Why is cold fusion considered bogus?" topic in this forum. The end state is that the largest bulk of claims is on excess heat, and I showed why the claimed results are not trustworthy. But rather than publish the calibration data, which the researchers ought to have done, they resort to illegitimate tactics which I discuss in the whitepaper. Not very confidence-inspiring. This picture then presents a group of researchers who collectively are fixated on a 'nuclear' solution, regardless of how well it works or what alternatives are presented, which is NOT how science is supposed to be done. The whitepaper adds one new aspect. I analyze the original F&P calorimetric method and point out the flaws in their approach, concluding that the 'excess heat' signals they observed back in 1985-1993 were just modeling errors arising from not including relevant chemical processes and from a mathematical quirk in the model equation. Perhaps if this analysis had been presented in 1991-2, there wouldn't have been such a furor over the claims (as happened to F&P's nuclear data, which were shown then to be in error and promptly discarded). You can also see lots of comments in the old sci.physics.fusion newsgroup and in my now-unused Wikipedia page. In summary then, it seems as if there is a real chemical process that occurs in F&P cells that can produce erroneous excess power signals, and that there are conventional chemical explanations for any block of results with enough contents to be called at least partially reproduced. Those explanations usually center on misunderstanding the impact of contamination and misinterpreting analytical results. Thus, there is no reason today to be compelled to accept a nuclear explanation of the observations. This adresses the known literature. For a more direct answer to the question, the issue with Cold Fusion is the lack of an accepted theory of the phenomenon. Nobody is sure how it happens exactly, and there are many people saying it doesn't happen at all. These denials are irresponsible and stupid--- there are over 200 reproductions of the effect, including most recently an undergraduate lab at MIT conducted by Peter Hagelstein where the students set up a cold-fusion cell, and observed the anomalous heat production (but new stuff is coming out all the time, see the news article linked below for a reproducible neutron burst in heated Pd-d). The topic has been censored and buried in a way unbefitting of science, and the data is festering on lenr-canr.org, bringing shame on the physics community for two decades now. 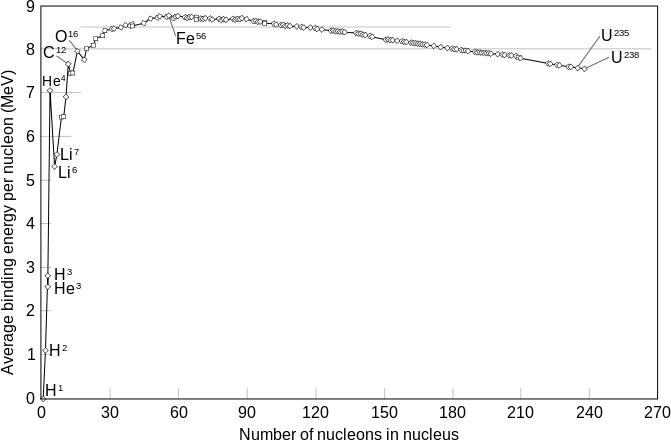 The main experimental evidence for cold fusion is that when you do electrolysis on Pd in heavy water, and the deuterium enters the Pd lattice as usual, sporadically, in the deuterated samples, you find that there is enormous heat production, far too large to be chemical energy generated or stored in the cathode. This must be done in small wires of Pd, to avoid melting the apparatus or risking an explosion or meltdown. The energy released is enough to significantly and obviously alter the calorimetry in the cell, so that you have 10-30% more energy production than in the controls, or in the experiment when you aren't producing excess heat. 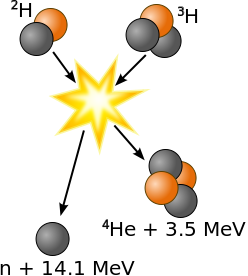 This energy production is accompanied by nuclear effects, which include spectroscopically detected elements which weren't there in the original sample and which are produced in unnatural isotope ratios, tritium production at trace levels (tritium cannot be produced by non-nuclear processes), He production commensurate with the excess heat, and X-rays and charged particles produced near the electrode, which are detected in co-deposition experiments using ordinary plastic particle detectors and photographic film. Pons and Fleischmann and McKubre did electrolysis, and noticed excess heat and correlated He production. Bocris measured large amounts of tritium production (and was accused of scientific misconduct for this, and exonerated), as did others in contact with Miley. SPAWAR group did co-deposition of d and Pd onto plates, and detected charged particles, and transmutations. There were also transmutations detected in deuterium passing through palladium. Arata did gas loading of Pd, meaning no electrolysis, and produced heat and correlated He. Since the effect is unexplained by accepted theory, making predictions about how to use it is impossible. So for the remainder of the answer I will assume that the mechanism is the one I described in the answer here: Why is cold fusion considered bogus? , that it is due to deuterons accelerated by K-shell holes, that fuse into alpha-particles, which then fly around making more K-shell holes in a chain reaction. This doesn't require new laws of fundamental physics, it simply postulates that deuterons and inner-shell excitations are quantum mechanically mixed in a metal, which is completely plausible just from electrostatic matrix elements estimates. The inner shell excitation energy for Pd is 20KeV, well above the threshhold for producing fusion. The charged particles produced from a fusion event naturally produce K-shell excitations (and other excitations in all levels, according to the Bethe theory of charged ionizing radiation), so there is a potential for a chain reaction. Any fusion reaction must proceed by dumping energy into electrons or nuclei, so that neutrons and protons don't come flying out, and this is not excluded from alpha-particle spectroscopy (although, again, deuterium fusion inside a high-density material has not been studied experimentally or theoretically to any great extent). This idea is hard to work with theoretically, because the inner shell transitions of atoms in metals are complicated. 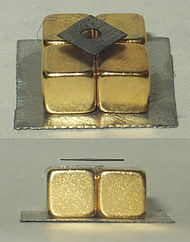 The electrostatic interactions mix the inner shells with excited momentum states of lattice deuterons, and it is hard to know if these states will band, localize, flow to the surface, or whatnot, because nobody has specifically done experiments on deuterated metals with highly excited inner shells. Nevertheless, the idea can make some predictions about making the reaction happen more reliably. One thing you can do is simply shine x-rays on the Pd, to excite the inner shells by hand. In the absence of a well-funded research project, you can't be sure the answer isn't as simple as this. For all we know at this point, you can build a reactor with Pd, d, and an X-ray machine shining on the cathode. What you are saying is that since the 115 keV is not at resonance, you won’t get any of this K-shell interaction. Of course, if that were true then XPS and Auger spectroscopy wouldn’t work either, because they irradiate the sample at a 1-10 keV and look at transitions at 10ev-1 keV, also not at the resonance point for the transitions they are observing. No, irradiating at 115 keV will stimulate some level of interaction with a 20-40 keV transition if such is possible. That would require inclusion in the energy balance equation, which has to be included in their modeling of electronic structure. This theory is submitted to Cornell University arXiv.org for review. I have enjoyed reading it as it opened my mind to the complex issues that arise in the dense many body system of the low energy nuclear reactive environment. LENR adatoms are of interest and I would suggest looking into plasmonic nanoparticle science. Peizo/thermal conversion science is of interest to understanding LENR phenomenon. And as this theory proposes, those understanding phenomenon of magnetic confinement and inertial confinement fusion may add to an understanding of how such could take place in (nano) atomic or subatomic space. "Two attempted crosslists for this article were rejected upon a notice from Arxiv moderators, who determined the submission to be inappropriate for the (General Relativity and Quantum Cosmology) and (High Energy Physics-Theory) subject classifications. So if you think that this article and theoretical works in the references deserve to be known by theorists (up to now, no other such kind of predictions of supraluminous effects with the correct order of magnitude came to my knowledge) please make it known." We investigate whether Dark Gravity theories (DG) with two conjugate metrics gµν and gµν = ηµρ ηνλ gρλ where ηµρ is supposed to be a background non dynamical and flat metric or an auxiliary field, actually predicted the occurrence of apparently superluminal propagations (from our metric side gµν point of view) such as the one recently reported by the Opera experiment. We find that indeed such theories could predict the order of magnitude of the superluminal velocity and even explain the apparent conflict with the SN1987 normal neutrino speeds provided the neutrinos are able to oscillate between the two conjugate metrics while propagating in a dense medium. We then explain the theoretical motivations and explore all possible phenomenological consequences of the field discontinuities naturally expected in some Dark Gravity theories. Since the Opera result was not confirmed, these discontinuities do not actually allow a propagation of neutrinos oscillating between the two conjugate metrics. A. Large extra heat (not possibly of chemical origin) with very low levels of nuclear radiations (alpha, beta, gamma, neutrons) as compared to what would be expected from nuclear processes producing the same amount of energy. In my opinion, any idea proposed to explain A or B but neglecting C is almost certainly wrong because it is unlikely that two kinds of very different new ideas would be needed, one to explain C and another to explain A and B, while the detections of the two kind of effects are clearly related. Indeed there is even an annual conference called Russian Conference on Cold Nuclear Transmutation and Ball-Lightning (RCCNT&BL) and there also have often been presentations on Ball Lightning at the ICCF conferences. clarifies A and B, ... Bingo! Good references to start to gather a list of typical properties of these objects are  (see references therein)   and i personally consider, following Lewis  that these objects can exist with very variable sizes and lifetimes and are all of the same nature as the much bigger Ball Lightning sometimes observed in thunderstorms so from now on i will generically call them micro ball lightning, or mbl. Their common source is most probably always an electric discharge including micro-discharges near metal surfaces in simple electrolysis experiments or in experiments where these discharges can result from the metal surface being submitted to mechanical, thermal or EM pulse shocks. Not the answer you're looking for? Browse other questions tagged energy fusion cold-fusion or ask your own question. Why does anyone take Cold Fusion seriously? Is there any reproducible tested evidence for Ni-H cold fusion? Does tritium hydride exhibit measurable spontaneous fusion via proton tunneling? Another cold-fusion reactor scheme :) Is it feasible? What is the shortest duration fusion reaction? Does muon halflife have any application in cold fusion concept? Could Excess Energy in Cold Fusion Experiments be Explained by Transmutation of Elements?